From the 1860s through the 1870s the American frontier was filled with Indian wars and skirmishes. In 1865 a congressional committee began a study of the Indian uprisings and wars in the West, resulting in a Report on the Condition of the Indian Tribes , which was released in 1867. This study and report by the congressional committee led to an act to establish an Indian Peace Commission to end the wars and prevent future Indian conflicts. The United States government set out to establish a series of Indian treaties that would force the Indians to give up their lands and move further west onto reservations. In the spring of 1868 a conference was held at Fort Laramie, in present day Wyoming, that resulted in a treaty with the Sioux. This treaty was to bring peace between the whites and the Sioux who agreed to settle within the Black Hills reservation in the Dakota Territory. The Black Hills of Dakota are sacred to the Sioux Indians. In the 1868 treaty, signed at Fort Laramie and other military posts in Sioux country, the United States recognized the Black Hills as part of the Great Sioux Reservation, set aside for exclusive use by the Sioux people. In 1874, however, General George A. Custer led an expedition into the Black Hills accompanied by miners who were seeking gold. Once gold was found in the Black Hills, miners were soon moving into the Sioux hunting grounds and demanding protection from the United States Army. Soon, the Army was ordered to move against wandering bands of Sioux hunting on the range in accordance with their treaty rights. 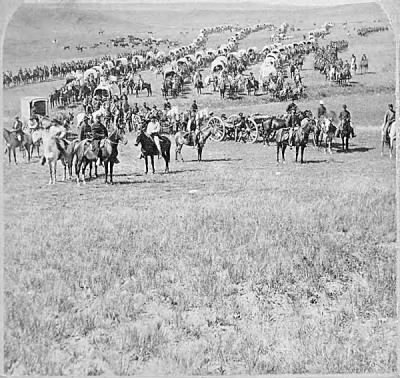 In 1876, Custer, leading an army detachment, encountered the encampment of Sioux and Cheyenne at the Little Bighorn River. Custer's detachment was annihilated, but the United States would continue its battle against the Sioux in the Black Hills until the government confiscated the land in 1877. To this day, ownership of the Black Hills remains the subject of a legal dispute between the U.S. government and the Sioux.